Preview is the default program for opening PDF documents on the Mac. 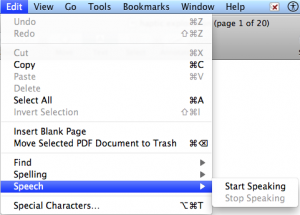 Preview’s speech feature can read PDF documents using the system voices built into Mac OS X. To use Preview’s speech feature open a PDF document and choose Edit, Speech, Start Speaking. To stop the speech feature, choose Edit, Speech Stop Speaking.